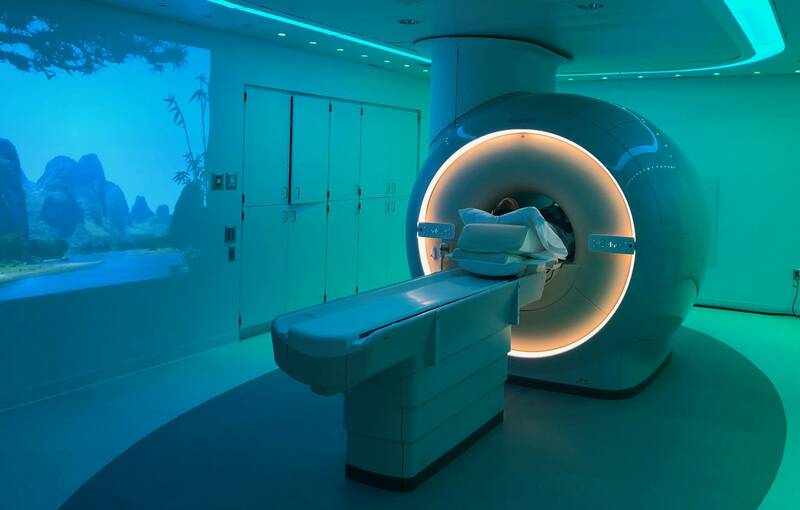 If you've ever been scanned by an MRI machine, then you know what it's like to have to lie completely still for maybe an hour in a large hollow cylinder. The experience makes many people feel anxious and claustrophobic, and it's hard for children to lie still. This week, Hennepin Healthcare — which used to be called HCMC — started using a new MRI scanner, which hospital officials say will make the experience easier to tolerate. 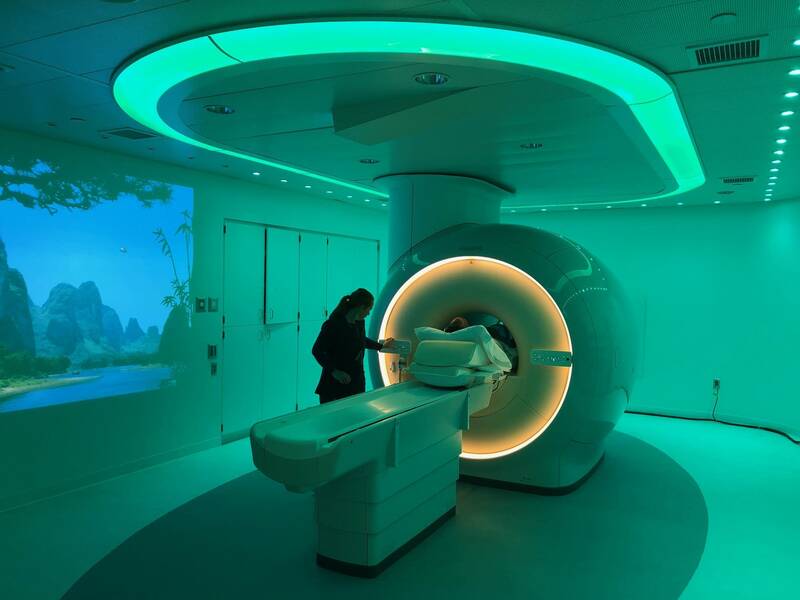 Hennepin Healthcare officials say the new machine, described as "the latest in Philips 'Compressed Sense' MRI technology," can detect ailments throughout the entire body. And it's located close to where it's needed most — next to the orthopedic center and the hospital's cancer center. MPR News reporter Brandt Williams got a first-hand view of the new machine, here's what he had to say about the experience. When Hennepin Healthcare asked if I'd like to get an MRI for a story, I decided to have them look at my left knee. It sometimes bothers me after I play volleyball. And the experience started off on a pretty blissful note. As I lie on my back with the lower half of my body inside the large hollow cylinder, I can hear soothing trance-like music through a pair of cushy headphones. The room — located in the newly built specialty center in downtown Minneapolis — is bathed in cool, blue lighting. As I look down my body past my toes through the machine, I can see images of white sand beaches framed by palm trees and turquoise waters projected on the wall. I nearly nodded off. But my mellow is soon completely destroyed by an intermittent cacophony of what sounds like the worst industrial music ever. The bursts last anywhere from 30 seconds to three minutes at a time. The sounds you're hearing had to be recorded from inside a protected room by MRI technician Dave Berg who talked to me through an intercom. "I'm going to record a little bit of that one making noise and then we should be done in about three minutes," he said. The MRI is basically a big magnet — powerful enough to erase all the data on my recorder — and possibly turn my microphone into a dangerous projectile. If you listen to the audio at the top of this page, you're hearing sound that was recorded from a small speaker, trust me, it was much, much louder from where I was hearing it. The procedure lasted about 20 minutes. Hennepin Healthcare's head of radiology, Dr. Chip Truwit, says that's a lot shorter than it used to be. He said this new machine — the first of its kind in Minnesota and costing more than a million dollars — uses a new technology which speeds up the scanning process. "So now we can get the scan in three minutes instead of nine minutes or six minutes. Or two minutes instead of four minutes," Truwit said. Faster scans mean patients spend less time in the tube. That, along with the ambient audio and visuals, said Truwit, can prevent patients from getting uncomfortable and start fidgeting. "And it eliminates repeat scans ... calling patients back to start all over again because there's motion. And when there's motion we can't read it," he said. Truwit said getting the scan right the first time not only saves the patient another visit, but it also speeds up the workflow process for staff members. So back to my knee MRI. 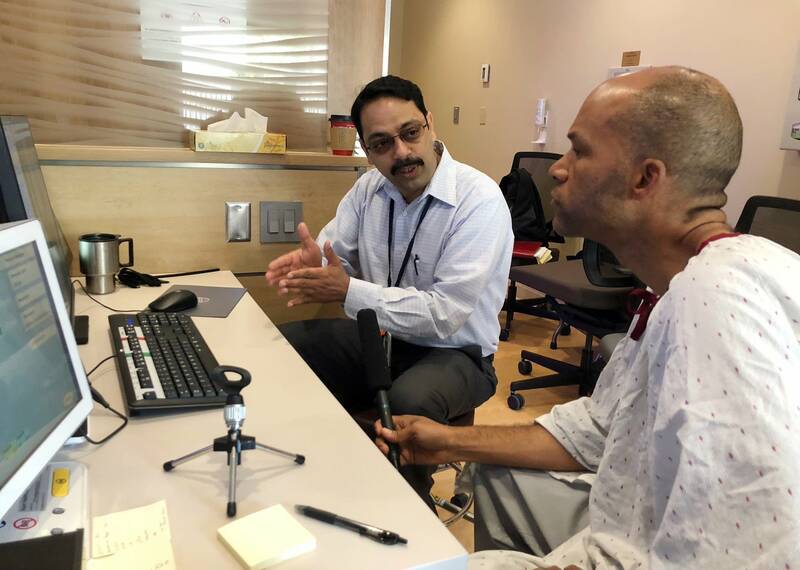 By using a computer to view the results of the scan, Dr. Gopal Punjabi was able to digitally peel away layers of skin and muscle tissue and peer inside my knee. "So here we can see the bone. And what you see here is the cartilage. This is the padding. In fact, you have remarkably good cartilage," Punjabi said. Reading a knee MRI is not his specialty, but obviously the doc knows a good knee when he sees one.